THE HEAD MEASURES 13 1/4"
April by Elkie Hutchens portrays a sweet young girl with a pensive expression. The 18 inch doll is on a 5 piece all porcelain body. 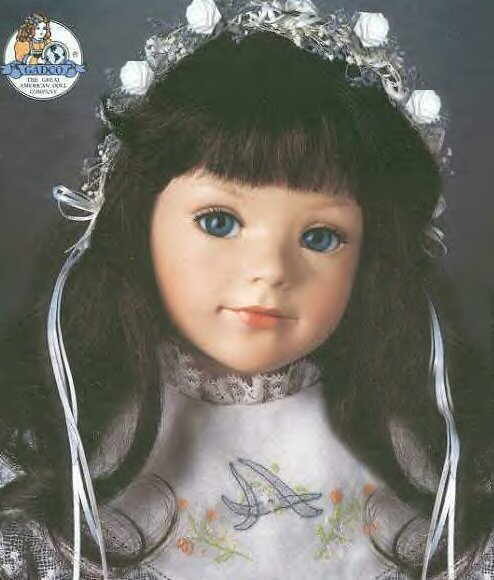 The 22 inch doll uses a porcelain shoulderplate, lower arms and legs. ?? ?wig size: l0", eye size. l8mm??? This original two piece Elke Hutchens mold can be made into a 24" all porcelain doll using Jones Mold #206 or soft body with your pattern, arms and legs. Markings on the side of the mold are as follows: "April" cIMSCO 1987 E. Hutchens. April has a beautiful face and she can be either a little girl or a beautiful young lady. I'm sure you will just love her.